In discussions over poverty and education policy in the United States, it is common to see international comparisons. These comparisons usually make the United States look quite bad -- i.e., 21% of our children are in poverty compared to 4% in Finland. To be sure, childhood poverty is a serious problem in the United States, one that we should address in many ways (such as reforming the tax code so that poor people are not punished for getting married or taking low-paying jobs, increasing the EITC, or even instituting a child allowance). Nothing that follows should be misconstrued as denying any of that. But in making international comparisons, we should also get the numbers right. What bothers me about the usual international comparisons of poverty rates is that they are relative to each country's median income. So people are counted as being in poverty if their income is under half of their own country's median. Such a measure is useful for thinking about inequality within countries. But the problem with making international comparisons is that countries differ in their median incomes. Indeed, in richer countries, people who have under half of that country's median income might actually be better off, in actual material terms, than people who are actually at or above the median income in poorer countries. Imagine two villages. In one, extreme wealth driven by oil wells has pushed the median income up to $200,000, but 30% of the people make $50,000 to $100,000; still, no one suffers from any material deprivation whatsoever (everyone has enough to eat, a place to live, etc.). In another village, everyone lives on a dollar per day and is in constant danger of hunger; half of children die in infancy from easily preventable diseases. The median income theory of poverty would say that there is a 30% poverty rate in the first village (despite its complete lack of material deprivation), compared to zero poverty in the second village (even though everyone is severely deprived). Yet who in the first village would trade places with the second? That said, we can say, accurately, that the first village suffers from much more inequality than the second. To the extent we care about inequality, separate and apart from material deprivation, we might worry about the first village's distribution of income too. But we shouldn't get confused and think that we're talking about poverty when we're really talking about inequality. What we need is a way to think about poverty and inequality separately, as two different concepts, without muddying the waters with a measure that conflates them for no apparent reason. Fortunately, there is an international measure of poverty that looks at what we should really care about when we say the word "poverty" -- that is, material living conditions. PPP, or purchasing power parity, is the usual term. Poverty rates measured by PPP and by median income are not always the same. In fact, they can differ quite substantially. The following chart from a UNICEF paper on childhood poverty makes this clear. As you can see, the United States' "relative poverty rate" for children was 21-22% in 2004, compared to just over 10% when judged in terms of real income. Compare Poland -- a relative poverty rate of approximately 18% but a real poverty rate of nearly 80%. If we use the relative poverty rate to make international comparisons, we'd have to say that Poland is doing substantially better than the United States. But if we care about actual living conditions of people in poverty, we should give more weight to the much larger disparity in real poverty rates, by which nearly eight times as many kids are poor in Poland than in the U.S.
For similar reasons, the World Bank cautions, "If you are interested in a particular country, you should use national poverty lines, which are defined according to each country’s specific economic and social circumstances. The national poverty lines are typically lower in poorer countries and higher in richer countries. 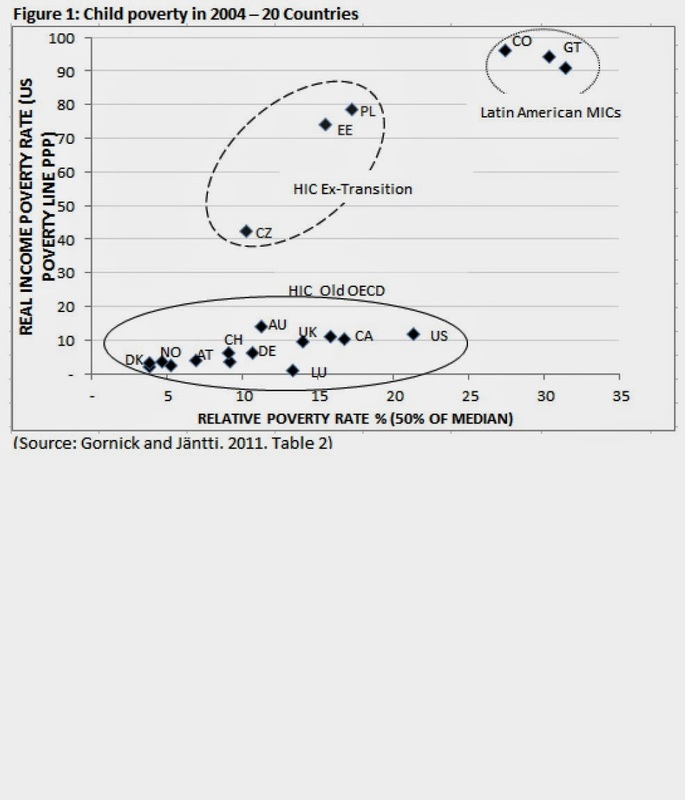 If you are interested in comparing poverty measures across countries, you should use international poverty lines. The international poverty lines attempt to hold the real value of the poverty lines consistent across countries by accounting for differences in purchasing power across countries." To be sure, our real childhood poverty rate is still double that of several European countries, so none of the above should be read to deny that this is a significant problem. Some anti-poverty advocates may find it difficult to believe, but it is possible to care deeply about poverty while not wishing to exaggerate the numbers.